As a Human Rights Officer volunteering in Cambodia you will be working with a Non Government Organisation who promotes the right to adequate housing and works to end the practice of forced evictions. Cambodia is a country that has long suffered housing rights violations. Now international and national organisations have come together to work as a coalition to see an end to the practice of forced evictions on urban poor. As a volunteer human rights officer, your role will be to assist the work of the task force in achieving an end to these violations. How can volunteer Human Rights Officer help in Cambodia? You position as human rights officer working in Cambodia is vital to the continued work of the Housing Rights Task Force (HRTF). The HRTF is a not-for-profit coalition of both international and national organisations and individuals. Their vision is to see a Cambodia that is free from all housing rights violations, where forced evictions are no longer carried out and everyone has access to adequate housing. Develop and update a range of Legal documentation. Provide legal advice and support (both written and face-to-face) on all matters, in particular those related to judicial proceedings before the court. Carry out legal research and analysis, and provide legal input and analysis as requested including for other departments. Promote law and policy reforms with government and other relevant institutions. Draft statements and press releases related to existing law. 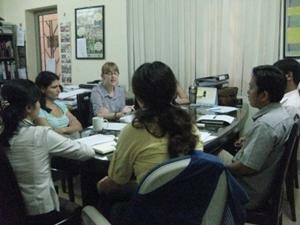 Coordinate and conduct meetings with NGO members and partners for law analysis and advocacy. Encourage the development of partners and government to adopt and enforce the National Housing Policy. Raise awareness of the lack of law enforcement to communities and relevant institutions. You will work Monday to Friday 8am-5pm with 1-2hrs lunch break. You will be involved with a friendly and highly dedicated team who are committed to the service they provide. You will be working in a country under different legal system and with different working practices; you will be able to adapt and develop your existing expertise to a different working environment. You will often face challenges not experienced in your home country. Through this cultural exchange you will learn different methodologies and techniques in your own discipline. Safe accommodation with a Cambodian family close to your project. If you have at least a Bachelors Degree in Law with a specialism in Human Rights Law or a related subject then you will be suited for this project. Ideally, a human rights officer would also possess at least two years’ experience of practicing professionally. If you are interested in this project but don’t have the relevant experience, then please read about our regular Human Rights project in Cambodia.